The Vision S7100 HRT Suspension elliptical offers users variable stride lengths, low to high inclines, and the company’s patented Suspension pedal design with PerfectStride™ technology. The S7100 offers a blue backlit LCD screen that gives feedback for time, distance, incline, resistance, strides/minute, watts, calories, heart rate, and profile display. CHECK IT OUT ON SPECIAL SALE NOW AT THE VISION STORE! The Vision S7100HRT Suspension elliptical is just 62" long, making it a nice compact frame compared to most front-drive models that can be up to 83" long. With no rollers or tracks, the suspended pedals sit on arms attached to the front-drive system. As a result, the suspension system eliminates roller resistance, dirt, noise, and other problems found on traditional ellipticals. It also features Vision’s PerfectStride™ technology which is the culmination of the ergonomic elliptical path, narrow pedal spacing, pivoting footplates, stride length, and incline adjustments to help you discover your most perfect striding motion. The Electromagnetic Current Brake (ECB) system is electronically-controlled using six magnets and a 23-lb flywheel to provide a friction-free and ultra-smooth glide. When mounting, you will find the S7100 has a convenient low 8.5" step-up height. 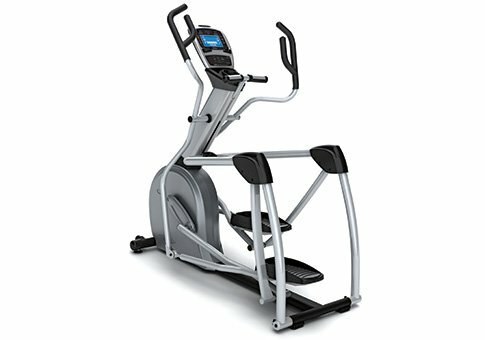 The Vision S7100 Suspension elliptical comes pre-loaded with 17 program levels (20 on the up-level S7200 model) including Sprint 8®, heart rate control, goals, manual, and more. A telemetric wireless heart rate chest strap is included. The exclusive SPRINT 8® workout program can be used in conjunction with the Ready, Set, Go! Synergy Fitness plan designed by Phil Campbell. It is a medically proven 20-minute workout used to increase HGH levels through exercise to control weight gain and get optimally fit. SEE THE BEST PRICE ON THIS POPULAR ELLIPTICAL HERE! There are not many reviews to be found on the exciting Vision S7100 but you can feel secure in buying one thanks to the superior quality of Vision products and the solid warranty backed by a company that cares about customer service. At $2,599 on sale, the Vision S7100 Suspension elliptical is the best value in the company’s line of ellipticals. Measured against other trainers at the same price, this Vision rates a Best Buy. 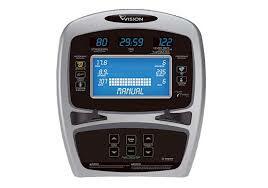 Vision ellipticals are on sale right now!